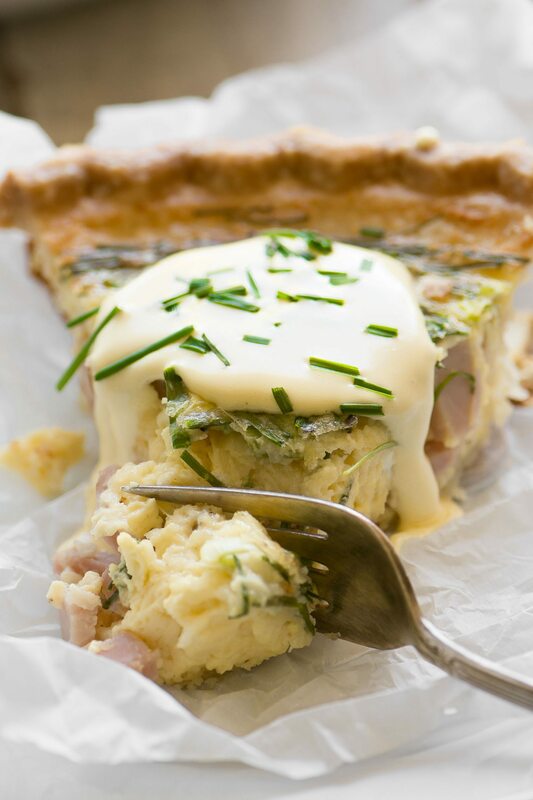 Eggs Benedict Quiche with Hollandaise Sauce ~ this brilliant hack lets you enjoy your favorite luxury breakfast in easy sliceable form ~ complete with little chunks of Canadian bacon and a quick and creamy hollandaise sauce! I think we can agree that Eggs Benedict is an epic way to start any day. We can also probably agree that it’s a rare morning when we have the motivation to whip them up. It’s a real shame. 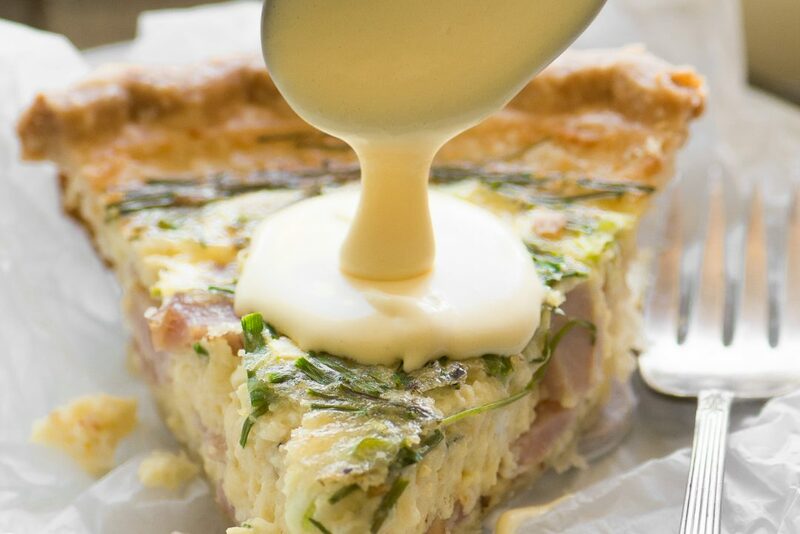 But with this Eggs Benedict Quiche you can truly ‘whip’ up 8 servings in a single bound. No messing around with poaching eggs (what’s with all that white floaty stuff anyway?) Just pop it in the oven and blend your hollandaise sauce while it bakes. 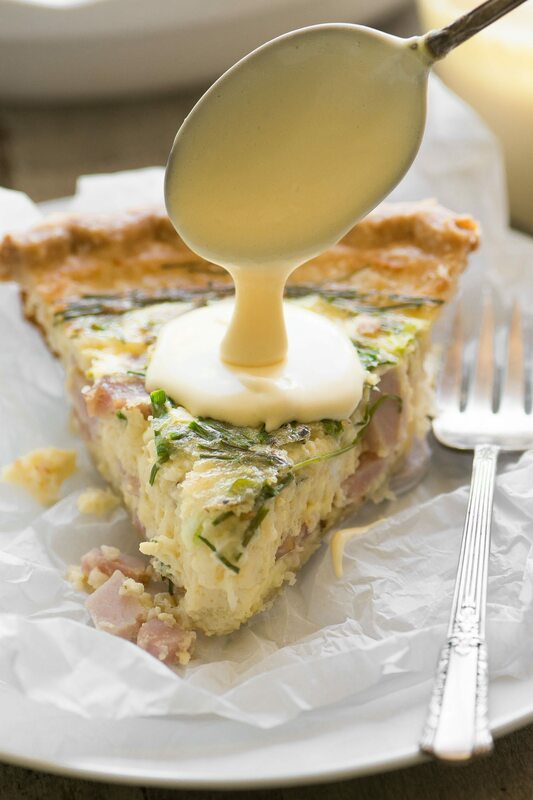 You can even make this quiche and the sauce a day ahead. Eggs are clearly the star in this dish ~ 6 whole eggs for the custard filling, and 3 rich yolks for the the silky hollandaise sauce. Don’t be afraid of the sauce, it’s classic and French, yes, but not so hard to make. In fact I’ve got a fantastic 30 SECOND HOLLANDAISE SAUCE that’s made right in a mason jar with an immersion blender. You can make it in your stand blender, too, which I’ve done here ~ but either way it takes just a few seconds and it has to be one of the most decadently delicious sauces in the world. 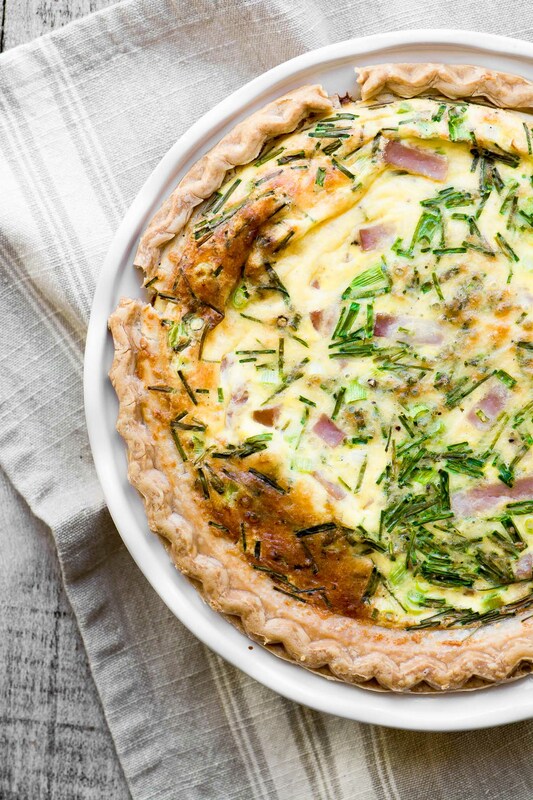 I add lots of onion-y flavor to my quiche with sliced scallions and fresh snipped chives. The pop of green looks pretty, too. Because it’s so easy I love to use frozen pie crusts, and as I’ve mentioned before, I love Marie Callendar’s…they’re nice and deep and they bake up flaky. My favorite thing to do is carefully remove the frozen crust from its tin, and set it right into one of my own pie plates. No one needs to know I’ve used a shortcut. Lightly spray a pie plate. Whisk or blend the eggs with the half & half until completely combined. I do this in the food processor, but you can use a whisk or hand held beaters, just be sure to do it well. Stir in the cheeses, onions, chives, ham or bacon, salt, and pepper. Gently remove your frozen crust from the tin it comes in and place it in your pie plate. 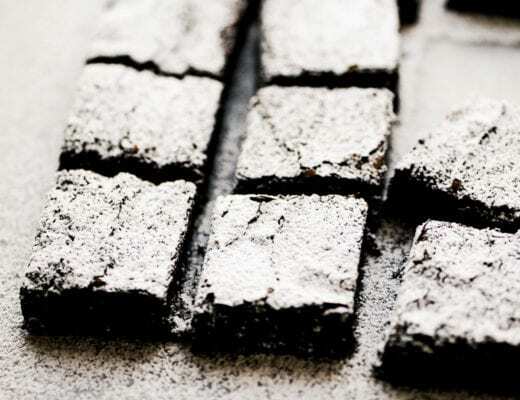 (This is optional, you can use the frozen crust its original tin, if you like.) I set my crust on a baking sheet, this helps to get it into the oven without spilling, and catches any potential drips during baking. 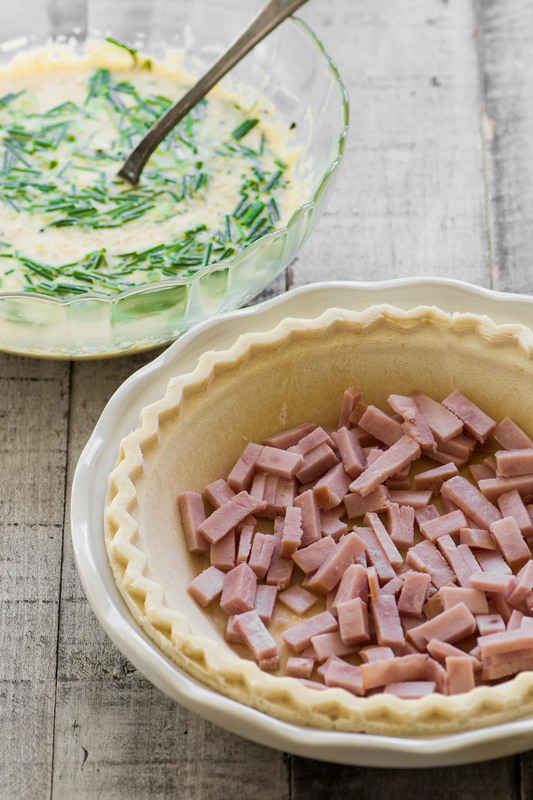 Pour the egg mixture into the frozen crust, and arrange everything evenly. Make sure you have a few bits of meat showing at the top. Bake for about 50 minutes, or until the quiche has puffed up a bit, and turned golden brown. It should be just set in the middle. You can use a toothpick test if you like. To make the hollandaise sauce, put the egg yolks, lemon juice, and mustard, into a blender. I use a Vitamix. Turn it on to blend the yolks. Then take the hot melted butter and, while the blender is on, drizzle it slowly through the top. The sauce should be thickened by the time you finish pouring in the butter. If it's too thick, you can thin it with some warm water. Add salt to taste. You can gently reheat the hollandaise sauce in the microwave, start with 15 seconds and proceed with caution, stirring well in between microwave bursts. 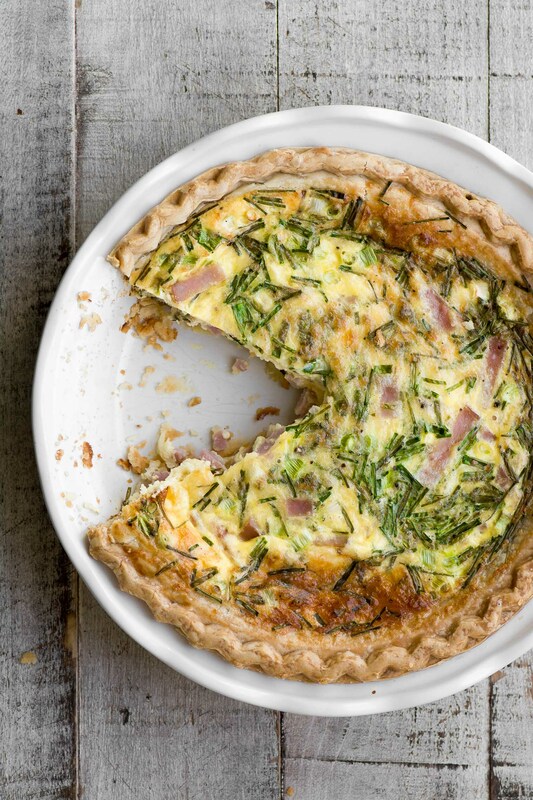 You can lighten up this eggs Benedict quiche by using whole milk in place of the half & half. You can make it more decadent by using heavy cream. Don’t forget to pin this Eggs Benedict Quiche! Any special instructions for making the day ahead? I mean do you bake it the day before, refrigerate and bring to room temperature the next day? If you bake it the day before, I’d refrigerate, and then reheat gently in a 300F oven, loosely covered with foil. I made this. It was a smashing success with my husband and 18 year-old. However, I used half the Canadian bacon recommended because I thought it was too much. I was wrong. It could have used the whole 5 ounces. Also, my scallions were super-size , but I stuck with three. I kind of knew better, but I stuck with three. Now, those things are my bad. What I’m trying to say is, stick with the recipe. It was really easy and I so impressed my family with it. My only meh of the recipe as it is written, is that I did use the Marie’s Calendar’s crust, but it wasn’t as flaky as I’d like. That only comes from a homemade pie crust, which I’m not doing. Never been able to perfect that skill. But then maybe it’s because I left the crust in its tin instead of putting it in a separate pie pan as the recipe recommends. lol I so agree, they need to get a small attachment for the Vitamix, I hate losing that last bit! Very, very good. We have one female duck who leaves an egg for me everyday so I used half duck eggs and half chicken eggs. The duck yolks are very large and very orange so it brightened the color and made it extra rich. It will be on our table again. Oh wow, I bet that was extra special ~ I want a duck! Your hollandaise is not hollandaise, it is flavored mayonnaise, and your ratio of egg to 1/2 and 1/2 is way too weak, 3 eggs to 1 cup of 1/2 and 1/2 swap in heavy cream to be decadent. Great concept but your technique falls short. I am a bit of a hollandaise addict! It would be perfect for an Easter brunch! Are you baking the crust frozen? How would you adjust the cook time if you are using a thawed crust? Plan on making this for dinner tonight! It looks DELICIOUS! I bake the crust right from frozen, and I would keep the time the same in either case, Evelyn. It’s really the filling that you need to check for doneness, and it will need the full time. 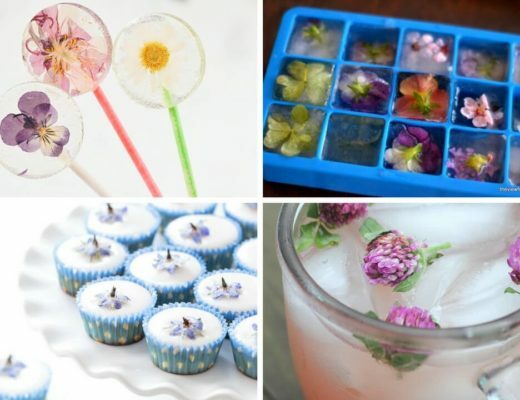 This recipe & your pictures look delicious! We love Eggs Benedict. Being that it’s just my hubby & myself at home (+ 4 dogs) I thought about trying to make it in smaller individual pie plates. I’ll let you know how they turn out. Thanks for the recipe. What a perfect family, I love the dog to human ratio ;) Let us know how the smaller quiches work out Ruthann. Oh wow! I am a huge fan of eggs benedict, but I am going to try this! 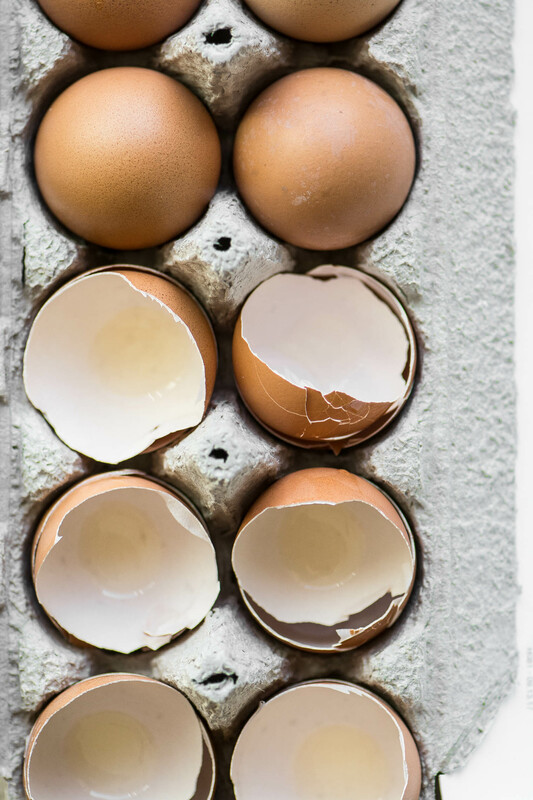 When you have fresh eggs from your own chickens, you are always looking out for new recipes! I’ll be making this this weekend for my husband Sue! He’s a total eggs benedict and quiche fan! He’s going to LOVE it! I knew you were sharp, but this proves you are absolutely brilliant! What a terrific idea. I haven’t tried the Marie Callender’s crusts, but I will. I usually make my own, but I also rather like a crustless quiche with toasted English muffins on the the side. I can’t wait for the weekend, so I’ll have to make this for dinner one night this week! I thought about making this crustless, let me know if you try it that way. Good morning, Sue…I’m trusting you including a Marie Callendars’ frozen crust! I’ve never checked ingredients or baked with one…. Meanwhile, and knowing how excellent your “Holidays’ Sauce” turns out, (our Family Fractured Name for Hollandaise), I’m Pinterest Saving for a Birthday Breakfast, in March! Oh that sounds fun Joy! 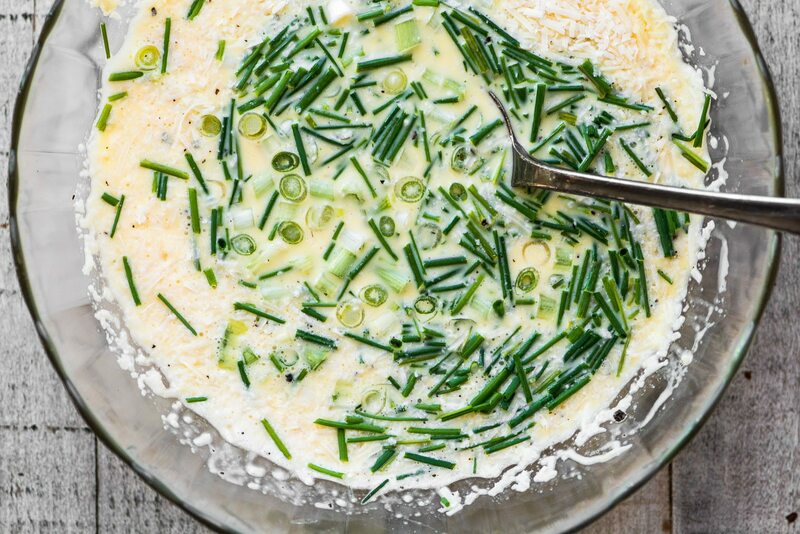 I love the new name for hollandaise, I think I’ll keep it :) I do like the Marie Callendar’s crust, but I’m not claiming they’re the most healthy ~ I’m pretty sure that’s not her arena, but nothing worse than a homemade version, I don’t think. Oooh, I’m hopping over to see! This is a wonderful recipe Sue! I love that you created this combination because Eggs Benedict is such a fantastic way to start the day and quiche is always a great idea. Lovely! Looks absolutely mouthwatering! I must make one for the Easter lunch! Oh my goodness, this is gorgeous and looks so… delicious! What a great idea. Now I’m wanting to have a brunch!